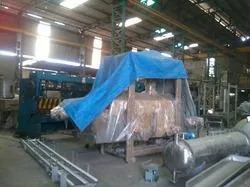 Established in the year 2004, we, Noida Fabcon Machines Pvt. Ltd., are one of the renowned ISO 9001:2008 certified manufacturers and exporters of an unlimited compilation of Conveyor Systems and Food Processing Machines. 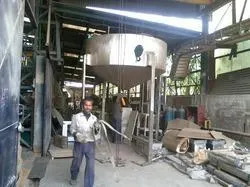 Our product assortment comprises of Food Processing Equipment, Snack Making Machine and Snack Making Equipment, which are massively appreciated and welcomed in the market for their consistent performance, low power consumption, longer functional, ease of operation, rugged construction, minimal maintenance, functional fluency and huge production rate. 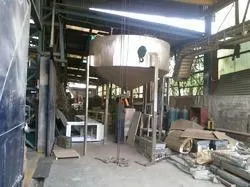 For the manufacturing process, we make use of fine quality raw material that is procured from our reliable and dependable vendors. Furthermore, it is ensured that all the set industry standards are followed. We are backed by a state-of-the-art infrastructure that comprises of a large number of efficient and supreme functionality machines, based on advance and modern technologies. 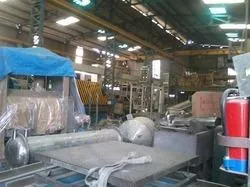 Furthermore, these machines not only help in the obstruction-free production but also, in the easy loading and un-loading of products. In addition to the outstanding range, owing to our constant efforts and undivided dedication, we have earned Nigeria, Sri Lanka and Bangladesh, as our exporting countries. We are highly acclaimed for catering to the varied clients’ demands, within the committed time period. Under the incomparable leadership of Mr. Nishant Bansal, our company has earned an unparalleled reputation among our customers. We are based on moral values & principles and involve in ethical business dealings only. Our firm is quality-centric entity that does not compromise on the quality of the products. The company does not compromise on the quality of our products. For maintaining consistent level of quality in our products, we ensure that all our products are developed using quality factor inputs procured from our authentic vendor base. 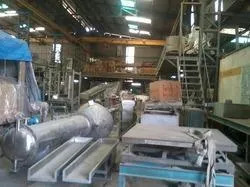 The quality analysts recruited by our company conduct rigorous tests of our products on different quality parameters before the final dispatch to our customers. Quality parameters on the basis of which our products are tested include efficiency, durability and reliability. 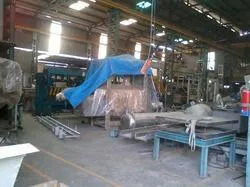 We have established a world-class infrastructure facility that is set up with different kinds of machines and tools, which are highly beneficial in attaining the exact quality that is demanded. 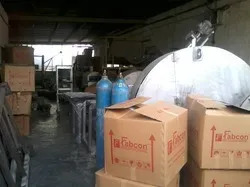 Also, to conduct all the operations properly, we have classified our workspace into sections that include manufacturing, quality control, warehouse & packaging, sales & marketing and administrative. All our machines and tools are regularly upgraded by a staff that manages the diversified operations and complete infrastructure. Maintaining the quality of our range is one of the major concerns of our company. In order to attain supreme quality, we make use of fine quality raw materials, which are procured from our reliable and dependable vendors. Furthermore, we make sure that all the existing industry standards and norms are followed to maintain the flawlessness of the range. Moreover, we conduct multiple tests on the selection, before handing over to the customers. From the very beginning, we have been offering high quality and in future, we wish to continue with the same. To offer best in class products as per customized requirement of the various industries. Continuously developing products that would help in improving efficiency and reducing cost for various industries. Quality Assurance quality cannot be built, it has to be created. 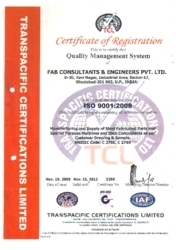 Quality Assurance & not quality control Fabcon is an ISO-9001:2000 certified Company. 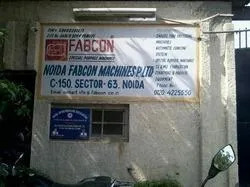 Noida Fabcon Machines Pvt. Ltd. is a celebrated name in the business, which brings forth an outstanding range of Process Equipment & Conveyors. We believe in proffering quality grade range to our customers and to make sure of the same, we follow various approaches that are client-oriented. Since our inception, we have been offering a perfect blend of quality and price to our precious patrons, across the globe. Team is what makes an organization. We are proud to have immense support of a team of skilled and experienced professionals, who are hired on the basis of their educational qualification, technical knowledge and years of industry experience. Our workforce is well-trained to understand changing trends and varied demands of our esteemed customers. Our team includes engineers, technicians, administrative staff members, packaging experts, quality controllers, sales and marketing executives. At regular intervals, we conduct different training sessions for our team.